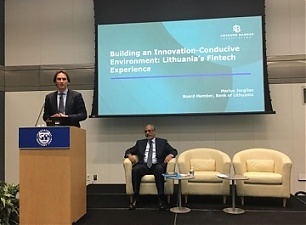 Marius Jurgilas, Member of the Board of the Bank of Lithuania, met with experts from the International Monetary Fund (IMF) and the World Bank, sharing Lithuania’s experience in creating a fintech-conducive regulatory environment, which falls in line with international best practices, informed Bank of Lithuania. “Lithuania is among the first countries in the world to put into practice the IMF and World Bank’s guiding principles regarding fintech regulation and ways to maximise its potential. Seeking to achieve a balanced approach, we maintain a supportive and open attitude to help foster innovation in the financial sector, while at the same time demanding strict regulatory compliance to ensure appropriate risk management,” said the Member of the Board. Given rapid advances in financial technology that are transforming the economic and financial landscape, in October 2018 the IMF and the World Bank put forward the Bali Fintech Agenda. The agenda advances key considerations with regard to fintech and its regulation, distilling them into 12 elements (including recommendations on stimulating growth of the sector and preventing the associated risks) that arise from the experiences of member countries. Lithuania’s approach to fintech falls in line with these principles. Several years ago, the Bank of Lithuania launched the Newcomer programme, a one-stop shop for meetings and consultations with potential financial market participants. Fintech companies developing innovative solutions can test them in the central bank’s regulatory sandbox; soon they will also be able to test blockchain-based services in its technological platform. The Bank of Lithuania has also introduced a smart e-licensing tool which enables potential market entrants to remotely apply for a licence in a faster, easier and less expensive manner. In addition, the country’s financial sector regulator gives payment and electronic money institutions full access to its payment system (CENTROlink), as well as promotes Open Banking, which is a rapidly expanding field of the fintech industry. The Bank of Lithuania has already granted more than 110 licences to fintech companies (crowdfunding and peer-to-peer lending platform operators, electronic money and payment institutions, specialised banks), the majority of which came from the EU, USA, Israel, Singapore and China. Last year, Lithuania was ranked first in continental Europe in terms of licensed electronic money institutions. Based on preliminary estimates, the number of applications for licences received by the Bank of Lithuania in 2019 will reach around 100. When assessing potential market participants, the Bank of Lithuania devotes particular attention to their ability to ensure compliance with anti-money laundering (AML) and other security requirements as well as the quality of services provided. To strengthen its international relations, the Bank of Lithuania has joined the global sandbox initiative and signed fintech cooperation agreements with the Monetary Authority of Singapore, the National Bank of Ukraine and the Astana Financial Services Authority (Kazakhstan). In 2019, the Bank of Lithuania, together with 8 other Lithuanian institutions, signed a memorandum of understanding, solidifying their intentions to join forces in fintech risk management.